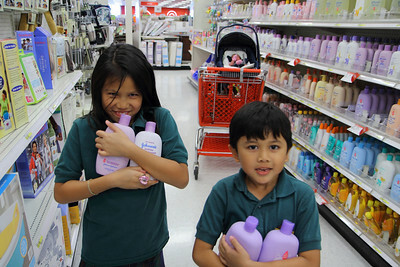 Armed with the Canon Rebel T3i, the Soriano tribe descended upon Super Target to hunt and gather edible subsistence. 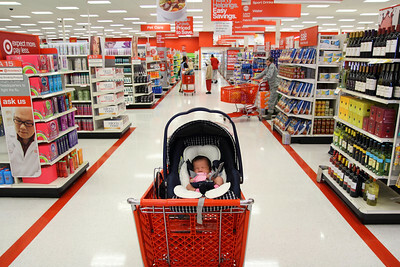 As the pseudo-dominant male of the family, basic essentials such as fragrant baby shampoo and baby back seat mirrors filled the fire red shopping cart. I train my young at an early age to listen closely for announced overhead bargains and have a sharp nose to smell refreshing baby body wash. With provisions gathered by my newborn's siblings, the real hunt for big game begins with a turn of my nomadic mini-van key. With precise focus, I point my Canon EOS Rebel T3i/600D towards my prey. 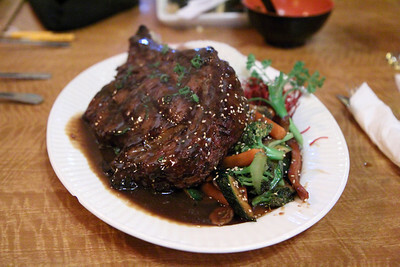 As soon I hear the AF confirmation beep, I pull the trigger and my 22 ounce Rib Eye goes down one juicy bite at a time. Of course, you cannot end the carnivorous meal without a sweet ceremonial finish. 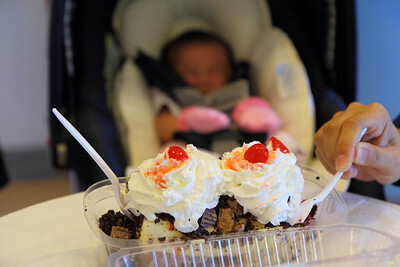 We track the "pitter patter of little feet" towards the local Carvel Ice Cream store. The weekday special of buy one get one free Banana Barges rewards our glorious hunt for the day. Just one more year until Serena can enjoy the sweet taste of ice cream! Until then, it is Kirkland Signature Infant formula and water on her menu. 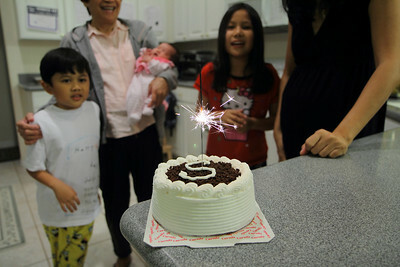 We just celebrated Serena's 1 week old birthday with a Carvel Ice Cream cake topped off with sparklers. Who said one birthday a year was a steadfast rule? This "Rebel-lion" was entirely shot with the new Canon EOS Rebel T3i/600D paired with the Canon EF-S 17-55mm f/2.8 IS lens. You can read and view more pictures and videos from this wonderful camera in my Canon EOS Rebel T3i Verdict and Video Review. Please become a Fan on my Facebook Page and follow me on Twitter for the latest updates and reviews of Canon HD DSLR gear on my ChadSorianoPhotoBlog! Hello again, sir! First of all, congratulations to you for your newborn baby. She's adorable and I like her name, too! (Serena) Anyway, I wanted to ask you about lenses. Do lenses have to do with the quality of a video or picture? I mean does lenses increases the video/picture quality? Would you say "better lens, better quality" ? Thank you very much! As they say, "It is all in the glass" when it comes to picture and video quality. To prove that point, I brought the Canon 5D Mark II and the Rebel T2i with me on vacation in Italy to compare video and picture quality using good glass. To no surprise, quality was almost identical where the 5D mark II gained the advantage with a more out of focus background due to its full frame sensor. Obviously, you get what you pay for when it comes to glass, but you do not have to break the bank to get that dreamy out of focus background look in pictures and video. The most popular and inexpensive choice is the Canon EF 50mm f/1.8. The next best more expensive upgrade is the Canon EF 35mm f/2. 35mm on a crop sensor gives an almost 50mm focal length equivalent. So, the prime lenses above are a good starting point for an inexpensive alternative. I have my Canon 60D and i tried taking picture in really dark area. I turned the lights off so it was totally dark. I tried to take a picture and it's not working. Why is that? Is it because the camera doesn't have anything to focus on? If so, is that mean, DSLR cameras doesn't work if there is no light at all? Pls pls pls respond :( Thank you very much! The 60D cannot focus with no contrast on the AF sensors, therefore it will not give you an AF confirmation beep to trip the shutter. You can switch off the AF button on the lens and the shutter will actuate but you have to manually focus the camera. Yes, John. 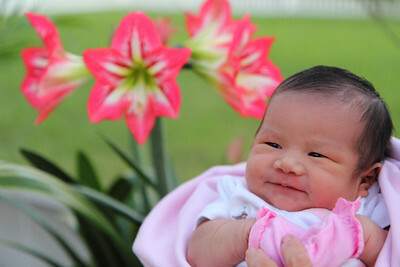 I am first generation Filipino born in the U.S. Greetings from Florida!